If there is pasta with squid ink as sauce, then I can definitely use the cuttlefish ink with my fried rice. You might think that the blank ink of squids of cuttlefish will just make the pasta or in this case the rice a black color, you are most definitely wrong. Using the cuttlefish's black ink is awesome, not only does it give a black color but also provides a unique flavor on the fried rice. The content of one ink sac or even just half of it will do the trick. How does it taste? Some would think it will taste very fishy but its actually not. The taste is a bit salty, brinier, mildly fishy, somewhat pungent, and has the rich flavor of the cuttlefish of course. And based on experience, the use of cuttlefish ink in fried rice makes it more delicious as compared to using squid ink. Just don't use the black ink excessively as it will make your fried rice salty. 2. Throw in the mixed veggies,black pepper powder, and sweet paprika powder, stir-fry for a minute. 4. Push the the rice to the sides of the wok to make a well. Pour a little olive oil then add the ink. Let it simmer. 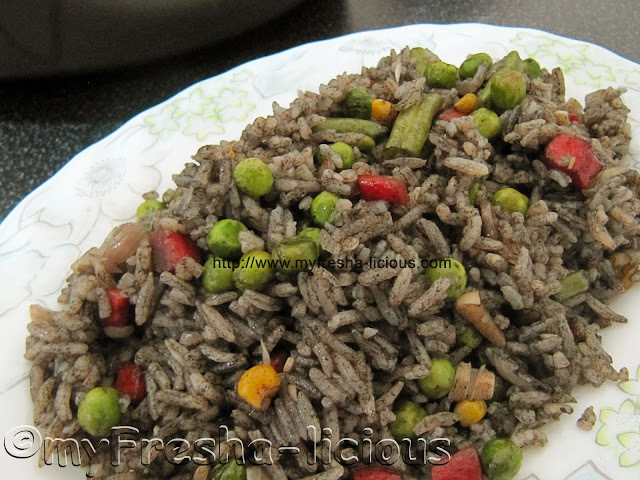 Mix the rice with the ink, make sure that the rice is fully coated. Stir-fry for a few minutes until the moistness evaporated. It's truly difficult to find true friends in this era. Someone who is going to knock your senses straight when your insanity kicked in deep. I'm lucky I found one in my good friend and tukayo who is always generous to share her recipes with me. Thanks Shaw!!! 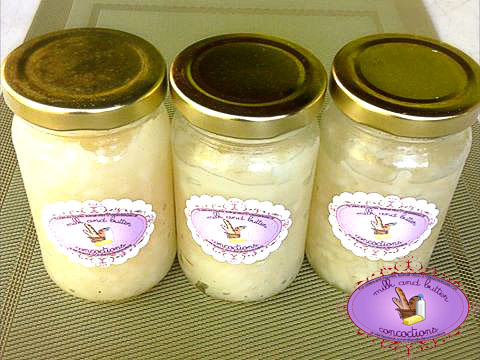 Minatamis na macapuno, is a Filipino preserved sweet delicacy that is often eaten as is or used in other Pinoy delicacies like halo-halo, cakes, kakanin, etc. When I googled the word macapuno, the descriptions I found were somewhat funny. Macapuno are considered mutated coconut. Yup, it's true. Try googling it. Once upon a time, our fellow Pinoy that makes kopra considered them useless and just throw them away as they cannot be made into kopras. Thanks to the genius who turned it into a delicious panghimagas (dessert). By the way, here is another description of macapuno from Tagaloglang : The Philippine Coconut Authority translates macapuno as coconut “sport” — it is the very soft endosperm of coconuts. What this means is that instead of the interior lining of the coconut shell being the firm solid white we’re all familiar with, it is more like translucent jelly. 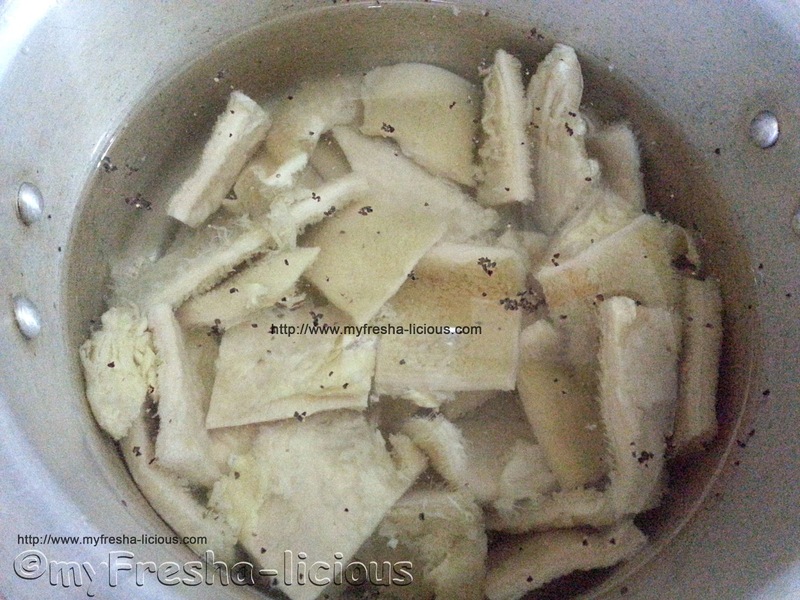 Here is my Tukayos's recipe for Minatamis na macapuno or sweetened macapuno. For those who wants to buy this just check her fb page at Milk and Butter Concoction. She's also selling breads and cakes. 1. Mix sugar and water in a saucepan turn on heat, stir until all the sugar is dissolved. 2. Put in the grated macapuno and pandan leaves. Make sure the macapuno is fully covered by the sugar syrup. 3. Mix continuously until macapuno strips are transparent. 4. Transfer to jars while hot. Half seal/half close the lid of the jar and sterilize (put in a pan with water then boil,low fire) for 25 minutes. 5. Remove from the pan then close the lid fully. Eating healthy is an option and there are many ways of doing so. One option is choosing the healthier meat, white meat over red meat. But you need not necessarily completely eliminate red meat from your diet unless they are triggers to your IBS (irratable bowel syndrome) or you're allergic to them. Just lessen your intake of red meat. Option 2: instead of using the usual high sodium salt, soy sauce, fish sauce, and other condiments use the low sodium alternative. We also don't recommend using low-sodium condiments all the time. You can use the the regular salt, sou sauce, fish sauce, etc. just lessen it and incorporate more herbs and spices in your dish. That's what we've been doing for the past few months since we are trying to eat healthier. Lately, I've been into lemon grass. I've been incorporating lemon grass in any dish as possible, may they be soup dishes, as stuffings, or part of a marinade. I just can't get enough of its refreshing flavor. We have other recipes of steamed fish you might be interested in, click steamed fish recipes to see them. 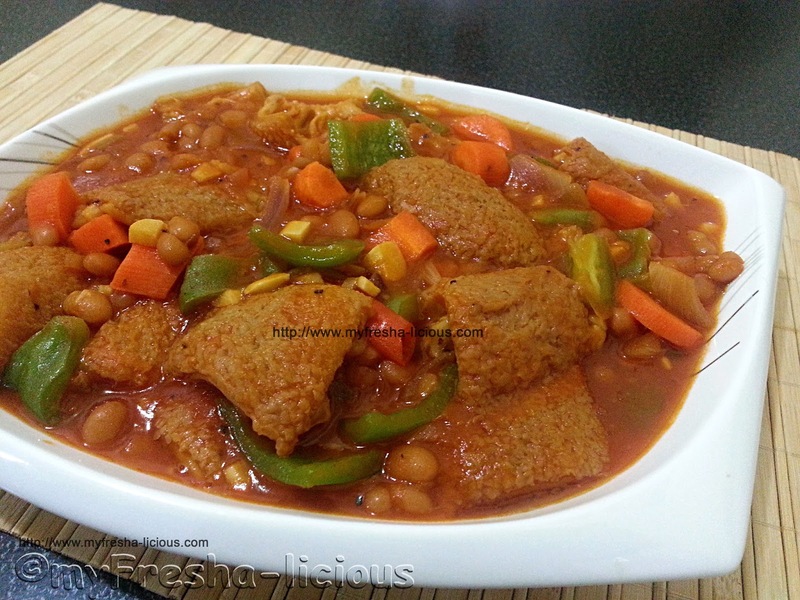 Click this for our collection of other steamed dishes recipes. 1. Gut and remove the scale of the fish. Wash and pat dry. 2. Cut 3 or 4 slashes on both sides of the fish. 5. After 2 hours, boil water in a pot or double boiler. 6. Stuff the fish with ginger, lemon grass, and scallion. Use only half of the spices. 7. Grease the aluminum foil with oil then lay the remaining ginger, lemon grass, and scallion on it. 8. 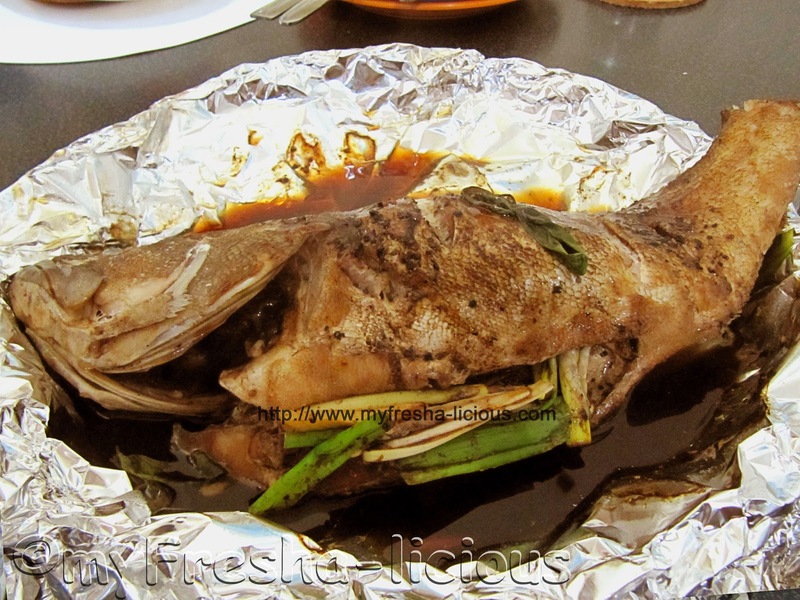 Place the fish on top of the ginger, lemon grass, and scallion then wrap the aluminum foil around the fish and seal it. 9. Place the fish on a steaming tray and steam the fish for at least 20-30 minutes depending on the size of the fish. 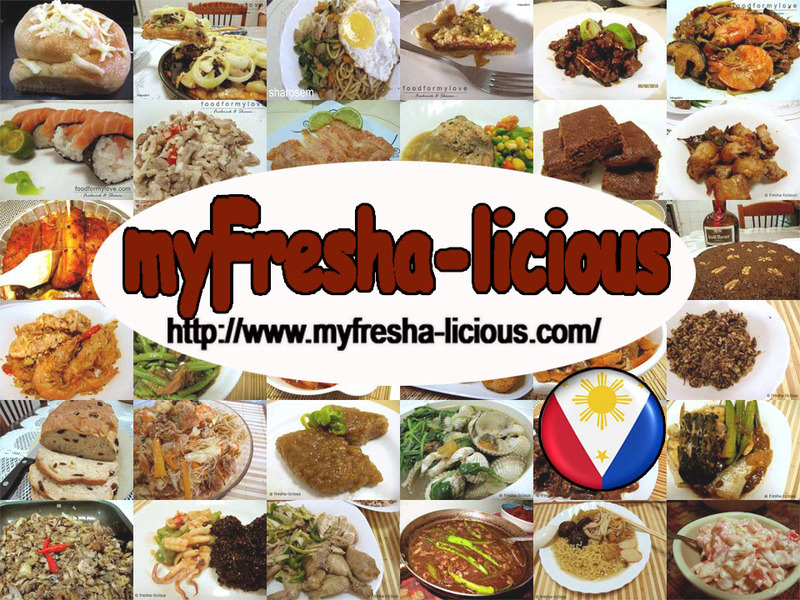 There's is this Filipino restaurant located near Hammad Hospital called Little Manila. Friends of ours have been recommending them to us many times already. 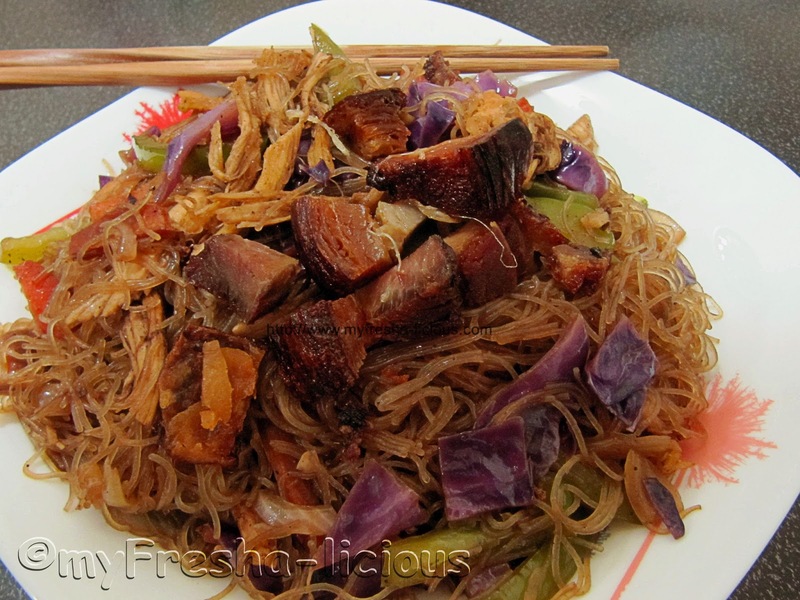 We actually just shrugging off the idea of eating there for several reasons: 1.We can cook Filipino dishes. Well, not all of course but... go to number 2 reason. 2.Filipino food here in Qatar is too expensive as compared to internationally known restaurants like Applebees, Nandos, etc. Spending Q45 (more than P500 / $15) per dish without rice and drinks is outrageous. It's not like they are importing the main ingredients (chicken, beef, fish, etc) from the Philippines, right? And it's not like the ambiance of the Filipino restaurants are comparable to Nandos and the like. Not even close. Some looks like plain Carinderias 3. Most of the time the taste is disappointing. Not that I am bragging, but we can cook Filipino dishes better than those found in some Filipino restaurants. Now if you cannot understand our reasons, go back to the reasons number 1, 2, then 3. Without further blahs, I made my version of the orange sotanghon guisado. And here it is. This picture did not give justice to the color of the sotanghon. Promise, it was orange when I took this photo. 2. Make the atsuete oil. Place the oil and the atsuete seeds in a small pan and heat it, stir until the oil simmers and its color turns to orange. Remove from heat and set aside. 3. 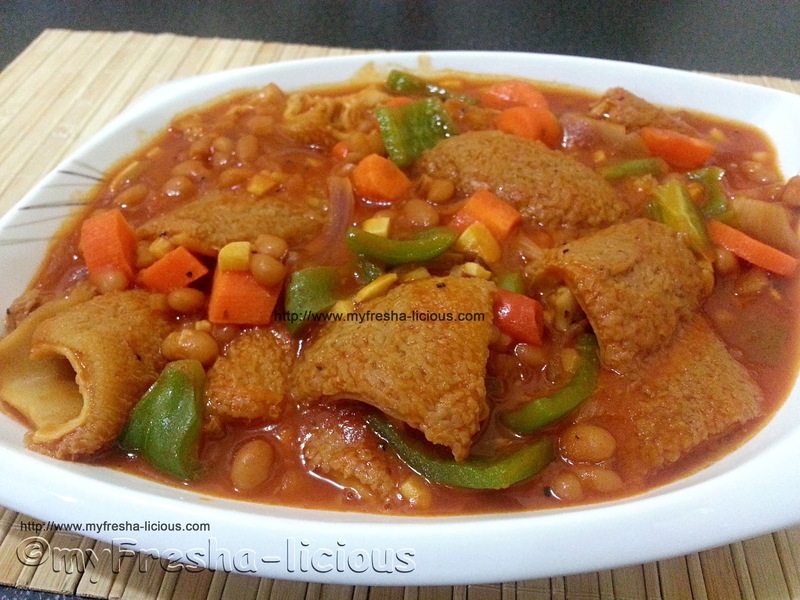 In a separate frying pan, heat 1 tbsp of vegetable oil in a pan and pan fry the lechong kawali until crispy.Remove the lechong kawali from the pan and set aside. 4. Pour the atuete oil in a wok then saute the garlic, onions, white part of the green onion leaves, and celery in it until aromatic. 6. Pour the water on the veggies along with the fish sauce and Knorr Chicken Bouillon. Let it simmer until the vegetables soften. Remove the vegetables and chicken from the pan and set aside. 7. Add in the sotanghon noodles stirring continuously to loosen the noodles. Add more water as needed. Adjust taste by adding low sodium salt as needed. 8. Once the noodles are cooked through, turn of the fire and stir in the cooked veggies, squids, and chicken. 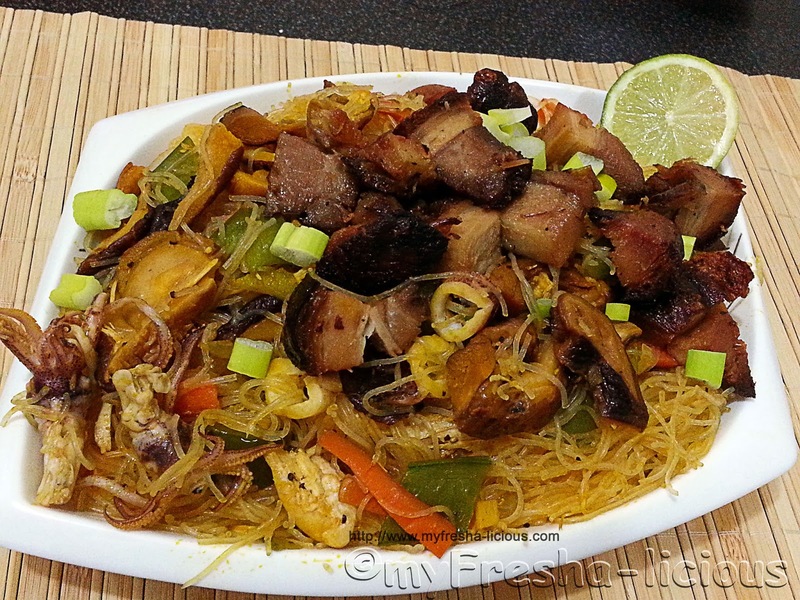 When serving, arrange the noodles on a serving dish then top it with the roasted pork and chopped green onion leaves. Serve with lime on the sides. It's been a while since my last post I know. There were lots of things I need to deal with that's why the blog was put on silent mode (evil grin). I'm not feeling quite myself yet but it's only 10 days more to go and it will be Christmas time and I owe you people some recipes you can add to your menu for noche buena. Pasta is no longer just an Italian dish. Every culture worldwide has developed their own adaptation of the Italian pasta dish. In fact, one of my favorite dish at a Turkey restaurant here in Qatar (Marmara Restaurant) is their Turkish version of spaghetti with tomato sauce. Actually, I've been trying to search for its recipe for a long time and there's none I can find yet. We Filipinos do have our own adaptation of the Italian pasta dish. Some Filipinos, mostly those who grew up in the Philippines, I'm not sure with those who grew up outside of the country, specially the kids love their spaghetti to be sweet with hotdogs in it. 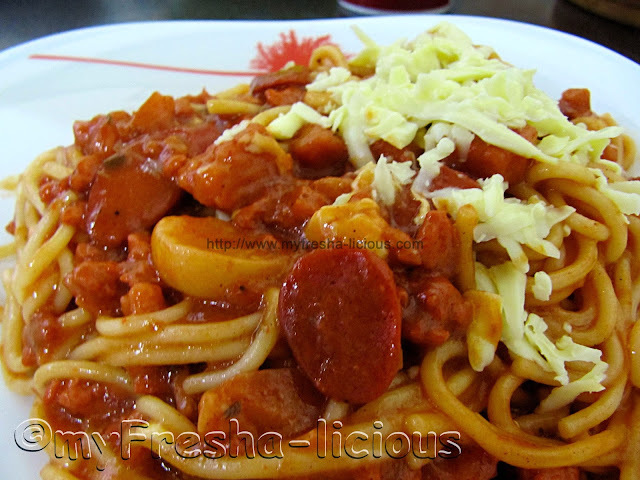 That's the Pinoy style spaghetti, it is sweet, it is red, with lots of hotdogs and cheese in it. 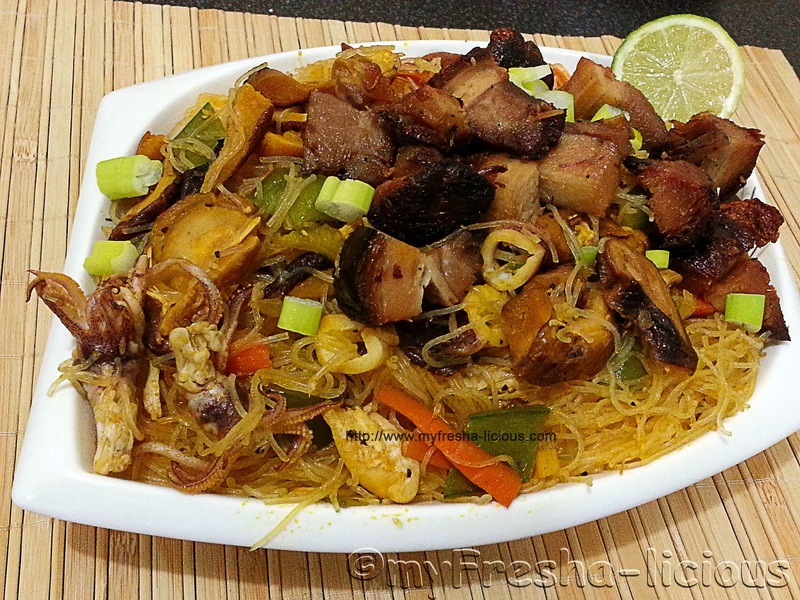 I will be honest with you, Pinoy sweet style spaghetti does not really appeal to me. I really don't like sweet sauces on my pasta. My husband on the other hand, loves it A LOT, like my niece and nephews. He often times request for Pinoy style spaghetti for either snack or dinner so I tend to stock up on a few ready-made Filipino Style Spaghetti Sauce (del monte brand). I only need to add a few ingredients to suit his liking and mine. 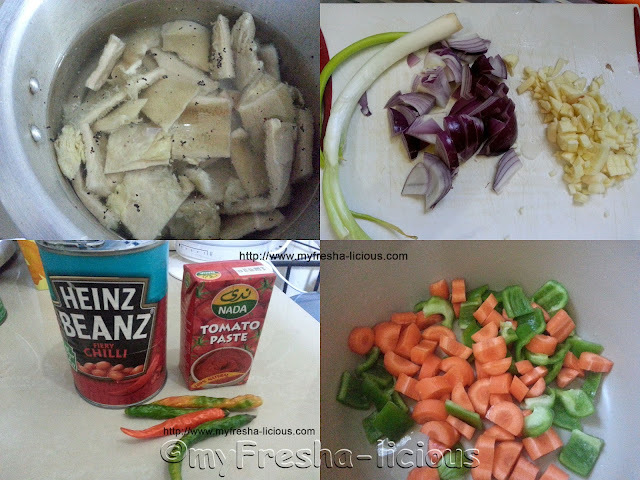 Good thing that we were able to find a good quality and tasty ready-made Filipino style spaghetti sauce, it spared me a few tantrums of cooking from scratch for this sauce. This spaghetti sauce can be used for 500 grams of spaghetti noodles or any pasta at that, but I usually cook 100 grams which is good for 2 to 3 persons. I just freeze the left-over sauce and then just thaw and heat them when needed. Try this in your next cooking. I guarantee that your kids will surely love it. Ground Chicken - 250 g.
2. Heat oil in a wok then sauté the garlic and onions until they are aromatic. 3. Stir in the ground meat and pan fry it until it almost turns brown. 4. Add in the hotdogs and stir for a minute. 6. Add the cheddar cheese and continue to simmer until the cheese melted. Adjust taste to your liking. 7. Pour the sauce on the spaghetti and mix. Serve with grated cheddar cheese on top. It is fascinating that just by changing one ingredient in a certain baking recipe, you will get a different outcome. 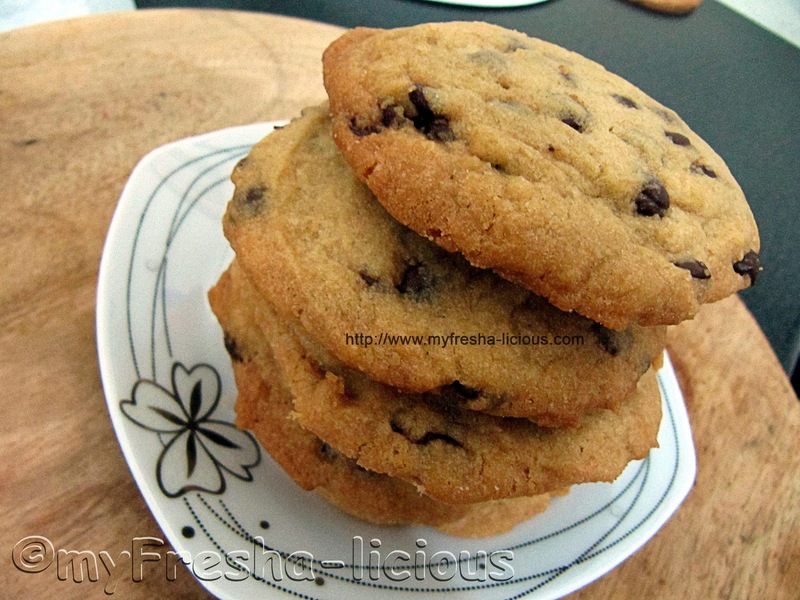 Last month I made a soft chocolate chip cookies (see the recipe here ) I used butter and the outcome was nice and soft. 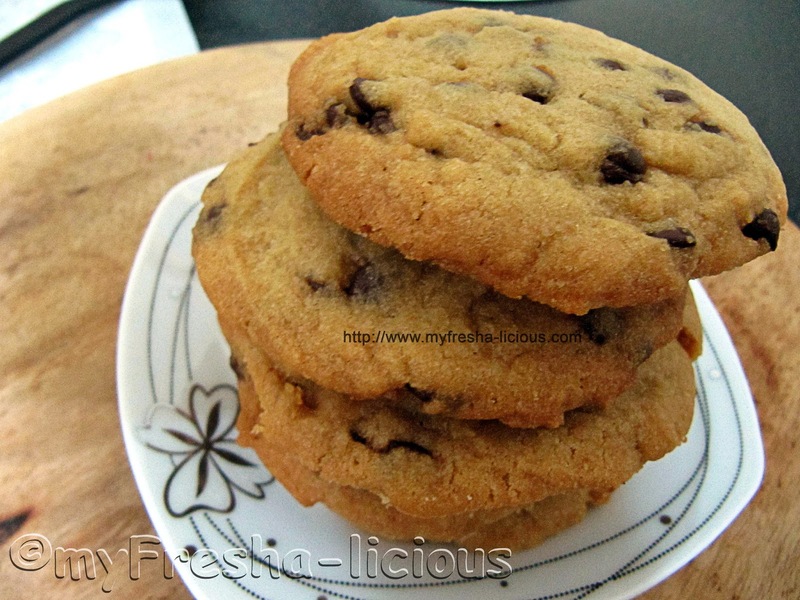 Using the same recipe, I made this chocolate chip cookies but instead of using butter, I used the butter flavored shortening by crisco. Well I just want to try it. According to the label on the crisco tub, if using the crisco as a butter substitute, I will use the same amount as the butter then I just have to add 2 tbsp of water. So the result are cookies that spread thinner as compared to those I first made using butter. In fairness, they were still delicious and the taste also has a hint of butter. I will be using more of this crisco butter flavored shortening in my future cookie experiment. All-purpose Flour - 300 g.
1.Pre-heat oven to 180 degrees Celsius. 2. Mix together the all-purpose flour, salt, and baking soda and set aside. 4. Cream the shortening, milk, and sugar together on low speed until fluffy. Slowly add the egg and vanilla essence. Cream until the mixture becomes light in color. 5. Add the flour mixture in 2 batches and mix under medium speed until fully incorporated. 6. Throw in chocolate chips and mix at low speed until just incorporated. One of my favorite fruit which I often use in baking is apple. And I often find them great with sugar and cinnamon. There are a lot of uses for apple in baking and I think I haven't maximize their uses yet. As to what kind of apple to use in baking, Eatingwell.com has an article discussing this topic. According to eatingwell, mcIntosh are great for pies and sauce. Granny Smith is also good if you want something sharp and tart in your pies. Red delicious is not advisable for pie as they lack the tartness a delicious pie needs. Honeycrisps are better eaten as is as they are sweet but they are also good for baking. You want my thoughts, I actually do not know. I use whatever apple is available in our kitchen. I don't even know nor bother to get the type of apple we buy. I like to eat Fuji apple and I usually use them in baking too. Fuji apple is probable one of the apples I know the name of, another is the granny smith which I prefer using it in baking and in my smoothies rather than eating them as is. 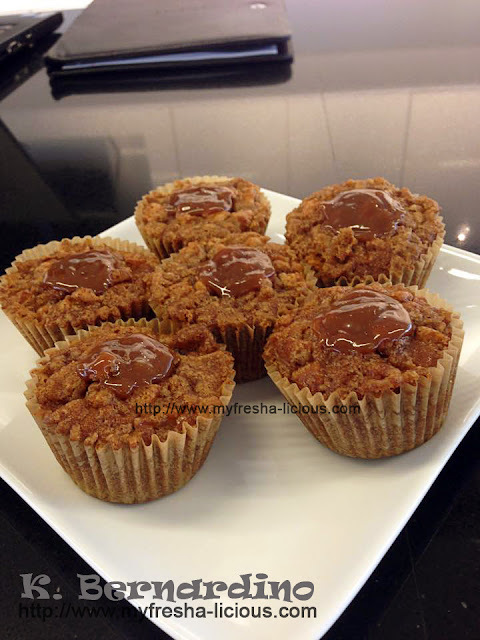 Anyway, here is another apple muffin recipe shared to me by my good friend Tin Bernardino. This is one way of making use of those apples you don't like to eat. If you need to convert the recipe into cups and tablespoon measurement, check our measurement conversion. 2. Mix together the all purpose flour, baking powder, baking soda, salt, and instant espresso powder.